Rotary Club of Port Blair was born on 27th May 1983 after five years of sincere efforts of Rtn SC Malhotra who went on to become the Charter Secretary . District 329 Governor Amuja Shankar Gupta presented the Rotary International Charter to Rtn Yaqoob H Mohammedy , the Charter President of the Club.The the then Hon’ble Lt. Governor of the Islands M.L.Kampani graced the occasion as the Chief Guest. It is the privilege of the Club that we still have the Charter President and Charter Secretary as Members of the Club. Each year the leadership at the helm changes hands and today we have 10 Past Presidents still as Active Members. The Members are from different vocations and professional classifications and are all dedicated to the call of Rotary which is SERVICE BEFORE SELF. The Club enjoys a distinct place in the District having won several District Awards starting from The Most Outstanding Club of the Year and The Best Club President Award in 2004 –2005 to District Awards for Best Projects on Underprivileged Girl Child and Best Rotary Youth Leadership Awards Camp. Many of the Rotarians have individually won appreciation from the District Governor for distinguished services rendered in respective years. The Club has constructed the Rotary Hostel for Girl inmates of Pranab Kanya Sangh and continues to patronize the Institution from time to time as required both from the club level as well as from the individual Rotarian level. In its efforts to offer Post Tsunami relief and rehabilitation our club in association with other Clubs of the District constructed 500 Intermediate Shelters for Tsunami Victims at Hut Bay worth abour Rs 1 Crore in addition to distribution of more than 200 Tonnes of relief materials worth more than Rs 40 lakhs. The Club receives Group Study Exchange Teams from all parts of the Globe every year – as ambassadors of their countries and they go back with pleasant memories of these islands spreading the name and hospitality of Andamans all over the Globe.This year we are receiving a GSE Team from Germany. The Club conducts Rotary Youth Leadership Awards Camp every year which is a residential camp for about 30 youths –boys and girls and they are given hands on training and exposure to different aspects of Leadership and Avenues of Life by the best available faculty and professional in the Islands including the Command Forces. Our Club with the Directorate of Health Services conducts several Health camps – ranging from Cataract Surgery , Implantation of Artificial Limbs to Blood Donation for the benefit of the people at large and all o this have received good response over the years.We started off this year with a Blood Donation Camp which was quite successful. In its bid to encourage the students , the Club felicitates the Island toppers in the Class X and Class XII Examinations and this year has honoured the Parents and School as well. In its efforts to create awareness against the menace of Plastics the Club organized a fortnight long programme of SAY NO TO PLASTICS with International Student Volunteers in 2001- 2002 which was very well received. The Club proposes to revive this year also with Bio Degradable Bags being planned for distribution among the Local Merchant Establishments on cost or subsidized basis. equipments for about 23 more Public Health Centres is in the finalization stage in association with RC Central Calcutta and RC Madison at a cost of about Rs 55 lakhs.. 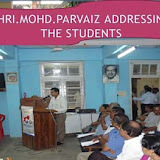 The Club also holds periodical Competitions for the Student Community in different fields like Quiz, Debate, Sit & Draw and has a very active Inner Wheel Club of Port Blair with whom we conduct all these programmes.. The Club also proposes to sponsor and start a Rotaract Club( For men and women in the age group 18-30 ) and Interact Club ( for the youth in the age group 14-18) in the Islands to strengthen the family of Rotary. Do all good you can , by all the means you can, in all the ways you can, in all the places you can , at all the times you can, to all the people you can , as long as ever you can. This has been the motto of the Rotarians of Rotary Club of Port Blair and shall remain so for the time to come. Rotary is an Organization of business and professional persons united worldwide who provide humanitarian service, encourage high ethical standard in all vocations and help build goodwill and peace in the world. Followed by Rotarians worldwide in their business and professional lives, The four-Way Test was created by Rotarian Herbert J.Taylor in 1932. It has since been translated into more than 100 languages. 1) Is it the TRUTH! 2) Is it FAIR to all concerned! 3) Will it build Goodwill and BETTER FRIENDSHIPS! 4) Will it be BENEFICIAL to all concerned! Club Service involves all of the activities necessary for Rotarians to perform to make their club functions successfully. Vocational service is a description of the opportunity each Rotarian has to represent the dignity and utility of one’s vocation to the other members of the club. Community Service pertains to those activities which Rotarians undertake to improve the quality of life in their community. It frequently involves assistance to youth, the aged, handicapped and others who look to Rotary as a source of hope for a better life. International Service describes the many programs and activities which Rotarians undertake to advance international understanding, goodwill and peace. International service projects are designed to meet humanitarian needs of people in many lands. First formulated in 1910 and adapted throughout the year as Rotary’s mission expanded, the Object of Rotary provided a succinct definition of the organization’s purpose as well as the individual club member’s responsibilities. FIRST.. The development of acquaintance as an opportunity for service. Paul P.Harris, the founder of Rotary was born on April 19,1868 at Racine, Wisconsin, USA. He was the second of six children and spent his childhood with his grandparents in New England who embedded in him upright values and Scottish prudence while being kind and warm. Paul’s grand parents filled him with the zest to live a purposeful life. Jean Thompson Harris (1881-1963). They had no children. As young man he was adventurous and inquisitive with a passion to explore life, places and people. He was the leader of a youth band called “Conspirators’. Paul worked as a newspaper reporter a business college teacher, stock company actor and a cow boy. He traveled extensively as a salesman for a marble and granite concern in USA and Europe. In 1896, he went to Chicago to practice law. As a practitioner of law, Paul did not find instant success. He said that he went hungry and forlorn many days. These days were mainly instrumental for the genesis of “Rotary”. Lonely days of Chicago promoted him to find friends for fellowship and to share mutual concerns. With Gustavus Loehr, Hiram Shorey and Silvester Schiele, the movement began and became history. Paul and Jean helped Rotary grow. He confessed “having no children of our own, Jean and I adopted Rotary “, Paul was never assertive inspite of being the Founder of the Rotary movement. He never sought prominence and would always take a back corner seat at the weekly meetings. Nevertheless he was a great human being. He was a great friend also. When he died on 27 January, 1947 he had desired in his will that he should be buried besides his great friend Silvester Schiele who was the first President of the first Rotary Club of Chicago. Such was the intensity of his friendship. He left behind him a rich legacy of fellowship and brotherhood for international understanding and service to humanity.